I have a passion for food as I love cooking and inventing new dishes all the time. However, it was not till a few years back that I used a pressure cooker to cook most of my dishes. Honestly speaking, I was a little skeptical at the safety. But after some reading and understanding as well as recently I bought one the safest pressure cooker, and it has just fueled my passion for cooking with pressure cooker even more. In this post, I will be helping you know more about the working of the pressure cooker and give you few of the best and the safest pressure cooker to choose from. So keep on reading if you are looking forward to buying one! Is It Safe to Cook With a Pressure Cooker? Why Should You Invest in a Pressure Cooker? The first pressure cooker was designed in the 17th century, and by the 21st century, it has evolved a lot. Nowadays, you can get your hands on some fantastic pressure stovetop or electric cookers at a reasonable price. Here is our list of top 5 pressure cooker (and they will make an excellent companion in your kitchen. If you are someone who prefers the stove top model, then this is a perfect cooker to fulfill your cooking requirements. This non-digital cooker comes with a stainless steel rack to cook several types of food at once. This model of stovetop pressure cooker is considered as the best option for all those who are looking for a low-cost cooker. If you are ready to spend some money and want to invest in some high-quality stovetop cooker, then go in for the Fagor Duo and even the America's Test Kitchen recommended it too. This stainless steel pot is made from dishwasher safe material and can easily work on all types of heat surface. Moreover, it also comes with features like stay-cool safety-lock handle, visual pressure indicator, and auto pressure release. A bit pricy compare to other models. If you want to try something different with the pressure cooker, you can pick up the electric models. 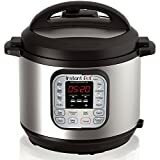 Cuisinart 6-Quart Electric Pressure Cooker is one of the least expensive best electric pressure cookers with best reviews. It comes with easy to use push button, cool touch handles, precision thermostat, and a digital display. You can use this for simmering, warming, browning or sautéing different food items. The Secura 6-in-1 Electric Pressure Cooker comes with excellent cooking functions. For example, the time control and automatic temperature system is definitely a plus. You can easily use it as an everyday pressure cooker, slow cooker, steamer, rice cooker and soup maker. It comes with removable parts. Thus cleaning is a breeze. The Secure 6-in-1 Programmer pressure cooker, sure enough, will be the best companion is your kitchen helping you make your next best culinary masterpiece. Some customer has reported about the customer service experience is not the best. The Instant Pot IP-DU060 is the real winner in the category of best pressure cookers! Instant Pot is a bit expensive when comparing to the above-listed cooker, though. However, the Instant Pot works wonder, and it can let you cook in a number of ways. With it's 14 built-in smart programs, you can use it to make yogurt, work as a rice cooker, for sautéing, steamer, warmer and much more. If you are someone who has not used a pressure cooker, let’s start from the beginning for you. Pressure cooking is a simple technique of cooking the food under pressure. In this process, a sealed vessel is used to prepare food using water or other liquid. The cooker does not permit the liquid or air to escape and thus the inside pressure never falls below the preset limit. One of the limiting factors while using a pressure cooker is the time it takes to cook food depends on the water’s boiling point. You must have heard that water boils at low temperature at higher altitudes. By the way, do you know that pressure cooker can even use to bake a cake? It’s made possible thanks to the no-escape cooking heat of the pressure cooker. I am not aware of such function is possible with a pressure cooker before. How wonderful is that! Anyway, here’s a quick recipe for different cakes bakes using a pressure cooker. Try it today! There’s a lengthy discussion all over the web on whether pressure cooking is a healthy option or not. Some people think that pressure cooking is bad for health while there’s a majority of cooks who believe that cooking food at high temperature and pressure is not dangerous at all. Here is a study indicating that cooking using a pressure cooker is safe and it can also help to preserve heat sensitive nutrients and cook the food in the shortest time possible. If you are looking to buy a pressure cooker, one of the considerations are the type of pressure cooker you prefer. Whether you want the stovetop pressure cooker or an electric pressure cooker? After deciding this, you also need to decide the material it uses to make the pressure cooker. When compared to their counterparts, stainless steel cookers are a bit expensive. They are prized for their durability and strength and can easily stand the test of time. Their finish stays like new even after using it for many years. One of the biggest drawbacks they have is that pressure cookers made out of stainless steel tend to be heavier, so make sure you pick up one with well-designed sturdy handles. Nowadays, various companies are coming up with their aluminum pressure cooker model. They are extremely affordable and efficiently conduct the heat. Aluminum pressure cookers tend to cook the food well in the shortest time possible. However, aluminum being very lightweight material doesn’t tend to last for a very long time, and durability is lower compared to the stainless steel models. Here are few reasons that will convenience you to invest in one of these safest pressure cookers at the earliest. Pressure cooking helps save time and money as cooking takes place 50% faster as compared to cooking in an open pan. 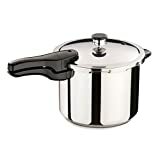 Stovetop pressure cooker or electric pressure cooker facilitates mixing of flavors, aromas, and ingredients, as everything is sealed within the chamber and nothing can leave. Pressure cooker gives you the option to cook many types of delicacies within a short span of time. Whether you want to cook vegetables, meat, soups, pot roasts, rice, stews, or even baking, it can be done easily in the pressure cooker. So there you have it. We hope that this post has helped you understand better about the safety of a pressure cooker as well as the usefulness in cooking. 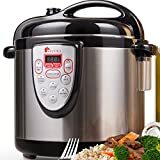 All the pressure cookers featured here are excellent, but if I have to choose, I will choose the Presto for stovetop pressure cooker and Instant Pot for the electric pressure cooker. Also, it’s worth to stress out that using a pressure cooker incorrectly can have reserve consequences not only for your cooking but might even damage the equipment. Therefore, always follow the product manual for proper handling. Let us know what you think about our recommendations. If we miss of any good pressure cooker and you believe that we should include into the safest pressure cooker list above, let us know by commenting below.